It’s Meatless Monday, people! And who doesn’t love Meatless Monday when you can eat like this! Whoa, these were some good tacos! I got the idea for these from the Beanplate blog, which I love because, well, we love beans. And evidently, we really like bean tacos, because I think I could have eaten 20 or 30 of these. Ok, maybe I couldn’t have actually consumed that many, but I really wanted to, if that counts. I made my own tortillas, which, I will say again are SO easy and SO good. But if you wanted to fry up some crispy tacos, I wouldn’t hold it against you. I love those too. 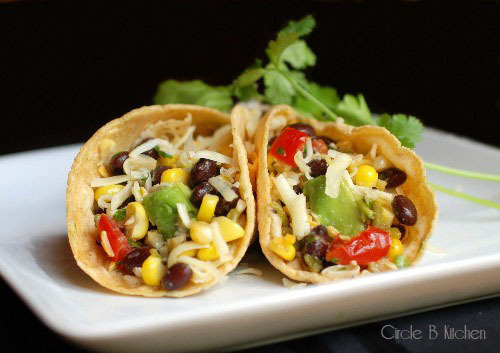 But soft, fresh tortillas seemed the perfect delivery system for this black bean filling, which is made with fresh corn, tomatoes, cilantro and avocados. I roasted up a poblano chile and added that to the mix, and then wished I had added another one. This delectable mixture is then dressed with lime juice, olive oil, a little honey and some salt and pepper. I topped my tacos with a little grated jack and cheddar cheese, but I think queso fresco cheese or even feta cheese would be good here too. Not in the mood for tacos? (is that even possible?) This black bean mixture makes an awesome salad on its own. Serve it on some crispy romaine, drizzled with the lime dressing and a scattering of feta cheese, or maybe you just want to serve it as a salsa with some chips. Or, grab a spoon and just eat it out of the bowl. It’s that good. Heat oil in large skillet over medium-high heat. Add corn and cook for 3 to 5 minutes, stirring occasionally. Remove from heat and set aside to cool. 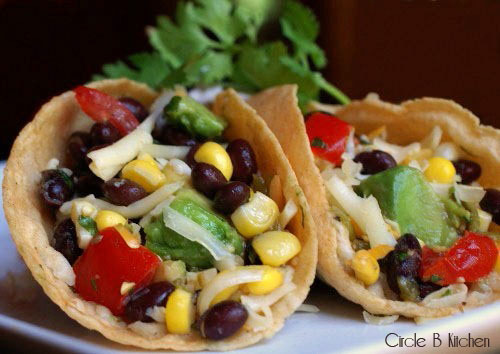 Once cooled, combine the corn with the beans, tomatoes, chiles, and avocado in a large mixing bowl. Mix the lime juice and honey in a measuring cup. Slowly whisk in oil. Add salt and pepper to taste. Pour dressing over salad. Add cilantro, mix gently to combine. Heat some fresh corn tortillas on a griddle (or pan-fry them for crispy tacos). Spoon filling into the tortillas, top with cheese and serve.